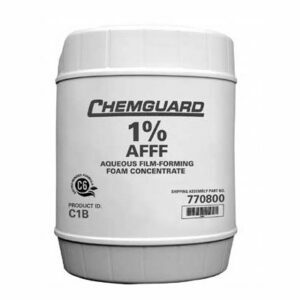 CHEMGUARD 6% AFFF INTL AVIATION is a specially formulated synthetic aqueous film forming foam concentrate. This foam is intended for use at a proportioning rate of 6% (6 parts concentrate to 94 parts water) on Class B hydrocarbon type fuels such as gasoline, kerosene, diesel, etc. AFFF type concentrates are not intended for use on fuels, which are polar solvent/water miscible such as alcohols, ketones, esters, etc. 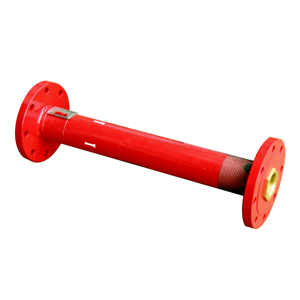 Suitable for use with carbon steel, fiberglass, polyethylene or stainless steel. When this product is proportioned correctly, aspirating type discharge devices can generate expansion ratios between 6-10 to 1. Non-aspirating type devices will typically generate expansion ratios of between 2-4 to 1. Expansion ratios are dictated by the type of Discharge Devices, flow rate and discharge pressure. 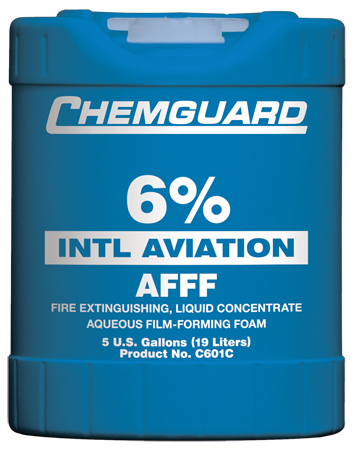 CHEMGUARD 6% AFFF INTL AVIATION. is compatible with any other comparable AFFF manufactured in accordance with and conforming to all performance requirements of CAN/ULC-S560 or any preceding version of this specification. 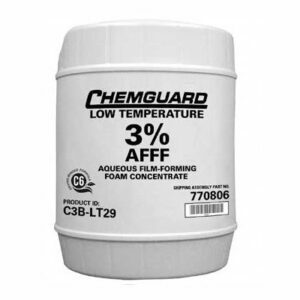 If kept in the original unopened and airtight CHEMGUARD supplied container and stored within the temperature range of 35 °F-120 °F (2 °C to 49 °C) a shelf life of between 20-25 years can be expected. When stored in other than the manufacturers supplied container, please check with CHEMGUARD for storage guidelines. CHEMGUARD C601C is biodegradable, low in toxicity and can be treated in sewage treatment plants. Please refer to CHEMGUARD Technical Bulletin regarding foam products and the environment.